Chimney cowls are a common sight on both domestic and commercial chimney pots and will normally be provided to stop pigeons or birds entering the pot or as a means of preventing debris such as leaves and twigs building up inside the chimney. 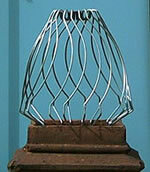 Some bird-specific chimney cowls are dual-purpose offering a steel mesh wall to stop pigeons or birds entering the chimney pot combined with a steel ‘hat’ to prevent rain from entering the chimney pot. The most common type of chimney cowl, or ‘chimney balloon’, is a round or conical wire device that fits into the top of the chimney pot itself, blocking access to the chimney for the purposes of nesting and denying perching opportunities on the lip of the chimney pot itself. 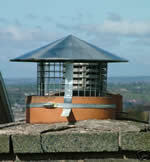 Chimney cowls are marketed to stop pigeons or gulls but can be used to control most species of medium and large birds. The most obvious problem associated with birds and chimneys is the fact that some species of bird, mainly the jackdaws, gulls, bats and occasionally starlings will build nests in chimney pots which may result in reduced flue efficiency and a resultant danger of carbon monoxide poisoning for residents. Both coal and wood give off toxins when burned and if these toxins are prevented from escaping through reduced flue efficiency, residents are vulnerable to inhalation which may exacerbate existing respiratory conditions in humans and in some cases may prove to be fatal. Carbon monoxide detectors, or smoke detectors combined with carbon monoxide detectors, can be fitted to warn of danger but these devices are expensive, certainly relative to the cost of a chimney cowl. Other problems include baby birds falling down the chimney as a result of poorly constructed nests as well as debris such as twigs and leaves (and resultant soot) falling down the chimney into fireplaces below. The Fire Service confirmed that it would have concerns over anyone fitting a chimney cowl, irrespective of the purpose, as there is potential for debris to gather around the cowl, thereby reducing the efficiency of the flue. The PCRC receives hundreds of calls each year from members of the public asking for advice on the control of wood pigeons that perch on the lip of their chimney pot and ‘coo’ down the chimney. As the chimney is simply a large funnel, when a bird such as a wood pigeon or a gull perches on the top of the chimney pot and makes any noise at all, that noise will be amplified very considerably by the time it reaches fireplaces in rooms below. This results in many property owners assuming that they have a bird trapped inside their chimney pot or alternatively that they have a bird nesting within the chimney pot. In most cases the sound is coming from a bird perching on the chimney pot and neither of the above. The noise generated by birds perching on the chimney pot can be extremely disturbing for residents in the property, particularly at dawn and dusk in the spring when breeding displays and mating calls are common. For this type of problem a chimney cowl would be the most appropriate control and would resolve noise-related problems instantly. Chimney cowls are available in a wide variety of shapes and sizes to ensure a good fit into the chimney pot itself and to provide the property owner with a product that will compliment the aesthetics of the property upon which the product is installed. The most common type of chimney cowl is the round balloon-shaped cowl made from wire mesh that is available in several different widths to fit most chimney pots. The cowl simply pushes into the top of the chimney pot and this completes the installation. 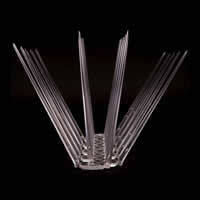 This type of cowl is normally the least expensive of all the options but is also considered to be the least effective. This is because although birds will be denied access to the chimney pot itself for the purpose of nesting, in most cases birds will still be able to perch on the top of the cowl. The conical cowl fits into the chimney pot in the same way as the round wire mesh cowl but has a spring-fit system whereby one size fits all chimneys. 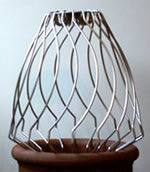 The conical cowl typically protrudes from the top of the chimney pot by approximately 15cm-28cm depending on brand. This type of cowl is normally more ornate than the basic round wire mesh cowl and is available in a variety of colours and designs to blend in with the property concerned. The conical cowl has sloping sides and in most cases some type of small spike in the top of the cowl so that birds cannot perch on the sidewall of the cowl or on the top of the cowl. The conical cowl will be normally be made in mild painted (M10) steel offering a more substantial and versatile product than the round cowl. 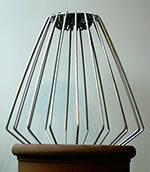 Some brands of chimney cowl offer an optional anti-roosting spike that can be retro-fitted to a conventional conical cowl which will prevent the problem of birds perching on the top of the cowl. 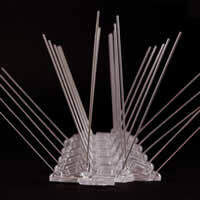 The additional spike is inexpensive at only £4.50 and would ensure that the chimney pot has total protection. Another option is a circular chimney rain/bird cowl made from galvanised steel mesh with a pointed steel ‘hat’ to stop rain from entering the chimney, as well as stopping pigeons or birds from gaining access to the chimney pot itself. The chimney rain/bird cowl sits inside the chimney pot in the same way as the round and conical cowls and is adjustable to fit most chimney pot diameters. 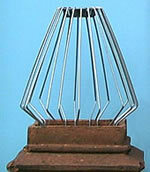 The chimney rain/bird cowl is secured to the chimney pot by a large jubilee clip. The only other option available for property owners who are experiencing bird-related problems and whose chimneys are no longer used, is to buy a chimney cap and permanently seal the chimney pot. The chimney cap fits over the top of the chimney pot and can be fitted with gull or pigeon spikes to stop perching on the top of the flat cap. The major benefits of a capped chimney, other than a resolution to bird-related problems, include reduced heat loss, protection against rain, hail and snow as well as protection against leaves and other wind-blown debris entering the chimney pot. The chimney cowl is a good inexpensive option for any property owner that experiences bird-related problems on or around chimney stacks. The product is extremely simple to install but, due to the height of a standard two-storey roof, health and safety issues in respect of access must be taken into consideration. Once installed, chimney cowls will resolve virtually all bird-related problems (although the round mesh chimney balloons may not resolve perching problems). They will also help to prevent debris such as leaves and twigs from building up inside the chimney which will be of particular interest for those who have trees overhanging their property. Chimney cowls can be sourced via the internet and there are numerous options available in terms of both aesthetics and design. The prices above represent the lowest UK prices for round chimney cowls, although prices can vary quite dramatically with the most expensive retailing at £32.31 + VAT for a large 225mm cowl. 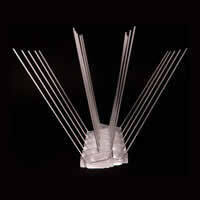 Conical cowls are available from many pest control suppliers, garden centres and suppliers of chimney products. Conical cowls are normally only available in one universal size for both round and square-shaped chimney pots and prices range from £11.04 + VAT through to £19.98 inc VAT. Colour options normally include terracotta and black. Chimney cowls that offer both protection from nesting birds as well as a conical ‘hat’ to stop rain entering the chimney pot are available for £15.99 from one internet supplier. These cowls require a jubilee clip to fasten them to the chimney pot. One UK pest control supplier offers a ‘C-cap disused chimney cap’ for use on redundant chimneys where a permanent seal is required. The ‘C-cap disused chimney cap’ is available in terracotta or buff colour and costs £28.58 + VAT. To date we have been unable to find any user reviews for chimney cowls but we will update this section as and when user reviews are made available to us. If you are able to provide a user review for chimney cowls please contact the Pigeon Control Resource Centre. Other than a basic product description, no detailed information was available from manufacturers or suppliers of chimney cowls. Chimney cowls are a cheap and efficient method of excluding both nesting birds and noisy birds from perching on chimney pots. Some cowls deny access to nesting birds but still allow perching to take place on the top of the cowl and therefore it may be necessary to install anti-roosting spikes on the top of the cowl. One brand of cowl offers an optional purpose-built anti-roosting spike which is designed to be fitted to the top of the cowl. The Ely Fire Service has confirmed that there are health and safety concerns where the use of cowls is concerned. The Fire Service pointed out that leaves and other debris can become wedged between the upright wires (or within the mesh) of the cowl causing reduced flue efficiency and in turn potential health and safety issues. Anything that has the potential to block an active flue should not be used or, if used, should be regularly checked and maintained. The Fire Service also confirmed that owners of properties that are over-hung by deciduous trees (trees that loose their leaves) or by excess vegetation should be particularly aware of the dangers inherent with fitting a cowl. One option where disused chimneys are concerned is to ‘cap’ the chimney pot permanently. This option may have appeal to many property owners who have chimneys but no longer use open fires. Capping the chimney will resolve all bird-related problems, including noise and at the same time will reduce heat loss within the property. Chimney caps can be removed should the chimney be used in the future. Noise-related problems are common for property owners during the breeding period with wood pigeons being the most common culprit. Where this problem is concerned, fitting a cowl will completely resolve noise-related issues although there may continue to be residual noise if the cowl is not fitted with an anti-roosting spike to stop perching on top of the cowl. Where nest building is a problem, a chimney cowl will effectively stop pigeons or birds but care must be taken to fit the cowl outside the breeding period. In the UK it is an offence to disturb any nesting bird or to interfere with a nest or its contents. Providing that a chimney cowl is fitted at the correct time of year and the property owner carries out a thorough inspection to confirm that there are no nesting or roosting birds in situ, the chimney cowl is an ideal option. It should be noted that bats will sometimes nest and roost within chimney pots and flues and if the property owner suspects that this may be the case a bat survey should be undertaken. It is an offence in the UK to disturb roosting or nesting bat populations. It is highly unlikely that any species of bird that breeds all-year round will be found nesting in a chimney pot so the months of November through to February should be safe period to install a chimney cowl. Anyone considering a chimney cowl as a method of bird control should be aware that once birds are deterred from perching or nesting on or in a chimney pot they may simply start perching on the chimney stack or on other parts of the roof. Chimney cowls are an exclusion device, not a scaring device and as such they may have the effect of moving a problem bird from its preferred perch but not scaring the bird away from the property. Where chimney cowls are used for the purpose of excluding roof-nesting gulls from building nests in chimney pots it should be understood that the likely response from the bird will be to immediately re-build a nest on the chimney stack itself or in the lee of the stack where the stack meets the roof. In this case the stack itself and the right angle created by roof and stack should be protected with anti-roosting spikes as should the top of the cowl. Gulls will always return to the same nesting site each year and therefore, in order to ensure that the birds are physically prevented from nest building, comprehensive proofing will be required.